Why does my tag look different than the one on my friend's car? These cars are part of a mass production cycle. As such, thousands or tens of thousands of subassemblies are made for them. Lets consider a 1971 Boss 351 Mustang. Only 1,806 of these vehicles were built. Every one of them had the same carburetor. Examining the tags that were attached to the carburetors, we find the following: Note the first picture shows a tag for a carburetor that was produced on December 2, 1970 and the second tag was for a carburetor that was produced one week later on December 9. 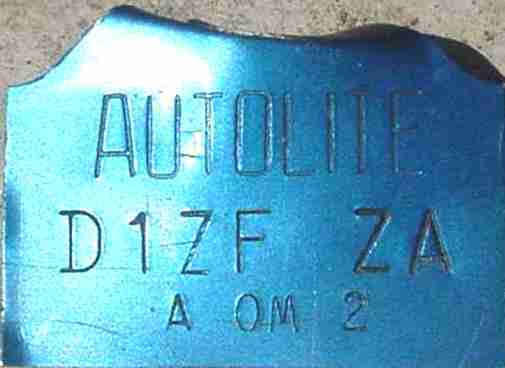 Observe how the first tag has the "AUTOLITE" as capital letters but the second tag has the "Autolite" as upper and lower case letters. This is typical of mass production. I own two Cougars with consecutive serial numbers. Yet, the fender bolts are from different manufacturers. Tags have many variations. 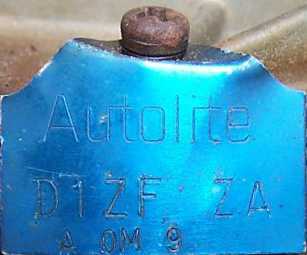 The 1965 Mustang had four different door data plates blanks. The spacing of the stampings was different for each assembly plant. The Dearborn assembly plant had two different spacing patterns dependent on when the vehicle was produced. A lot more information on these variations can be learned by purchasing the book, "The Mustang and Cougar Tagbook"